157 October-1938. Nov.-1938. images-5 newspaper clippings of various sizes cover the top half of the page. Over one clipping is written Nov. 1938. 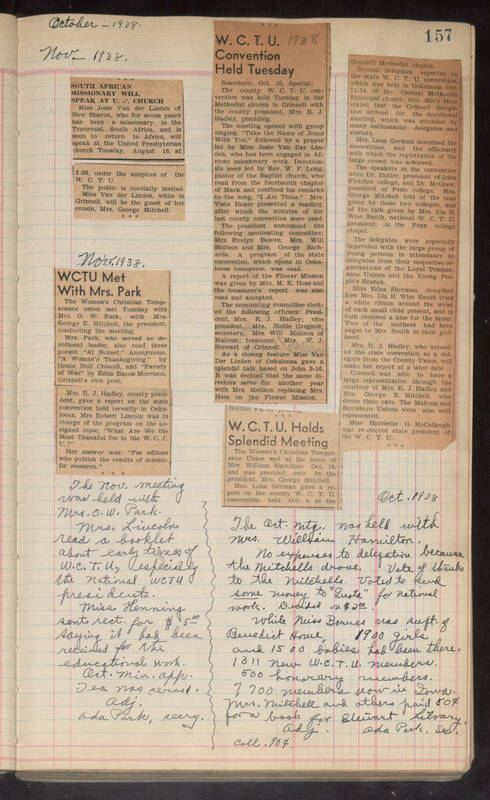 Oct. 1938 The Oct. mtg. was held with Mrs. William Hamilton. No expenses to delegation because the Mitchells drove. Vote of thanks to the Mitchells. Voted to send some (underlined) money to "Quota" for national work. Decided on $2 00. While Miss Barnes was supt. of Benedict Home, 1900 girls and 1500 babies had been there. 1311 new W.C.T.U. members. 500 honorary members. 7700 members now in Iowa. Mrs. Mitchell and others paid 50c for a book for Stewart Library. Adm. Ada Park. Sec. coll.90c Nov. meeting was held with Mrs. O.W.Park. Mrs. Lincoln read a booklet about early times of W.C.T.U., especially the National WCTU presidents. Miss Henning sent rect. for $5 00 saying it had been received for the educational work. Oct. min. app. Tea was served. Adj. Ada Park, secry. image-the Nov. 1938 minutes are on the left side of page and the October 1938 minutes are on the right side and a wavy lines divides them.